"Boys (The Co-Ed Remix)" is the fouth single (fifth, or sixth in select countries) from Britney Spears's 2001 album Britney. The song was released during the third quarter of 2002. The song was written and produced by The Neptunes. For its release, the single was re-vamped as "The Co-Ed Remix," and featured help from Neptune Pharrell Williams on vocals. The track was also featured on the soundtrack for the film Austin Powers in Goldmember. 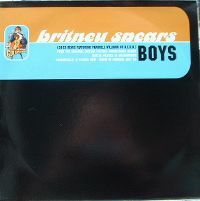 The song shows Spears explaining that even though there are benefits to being single, "Boys" are sometimes what a girl needs. Although "Boys" was meant to be Spears' comeback single in the U.S. after the failure of the rest of the releases from the Britney album (aside from "I'm a Slave 4 U"), it ended up flopping harder than any of her previous singles. The song failed to chart on the Billboard Hot 100, and peaked only at number nine on the Bubbling Under Hot 100 Singles chart (equivalent to number 109 if the Hot 100 ran past one-hundred ranks). Regarding Top 40 radio, the single charted only on the lower-half of one of the component charts: the Mainstream Top 40. "Boys" is also arguably her biggest international flop to-date, as it failed to ascend to the top ten in almost every country, and also missed even the top twenty in several regions. The single was a success in the U.K. debuting at seven and selling a total of 74,000 copies. hat die überhaupt ahnung wovon sie singt? Weiterer Kracher von Britney Spears - Genialer Song! War 2002 eine #7 in UK und #14 in Australien! nette nummer aus den schmieden der neptunes..
Mehr schlecht als recht. Durchschnittliche Massenware und nichts besonderes. diese nummer zerrt an den nerven. Einzel ganz gut, wobei Brintey logischerweise um welten besser ist...aber als Duo total unsympathisch!!! The co-ed mix made it more radio friendly. Although it is one of her least successful singles in the U.S missing the Billboard 100. It just wasn't overly memorable. Britney seems to love it tho because she has used it in every concert/tour setlist since 2001. Britney also appeared singing the album version in the opening scenes of Austin Power's Goldmember competing in a dance off. Nicht wirklich eine Glanznummer von Britney und Co.